Who is teaching all of these additional courses?, you ask. Well, here we go: The Economics Department is pleased to welcome two visiting professors, M. Taylor Rhodes and Satis Devkota, for the 2013-14 academic year. Professor M. Taylor Rhodes hails from Charlotte, North Carolina, where he completed his doctorate in economics at UNC Greensboro in the Spring of 2013. Other stops along the way include the University of Virginia and Penn State. At Lawrence, he is teaching introductory macroeconomics (Fall and Spring), advanced topics in Sports Economics (Winter), and labor economics (Fall). He has an active research agenda in applied microeconomics, including local economic policies, topics in sports economics, and the introduction of new beer brands in the US beer industry. He has four years of teaching experience, both in the classroom and online. In his spare time (?) he is something of a computer jock — listing his hobbies as desktop Linux, open source software and network and cloud computing. His aspirations for the year include the creation of his own cloud. Professor Satis Devkota, completed his doctorate at Wayne State University in 2012, focusing on Health Economics and Comparative Health System. This year he will be teaching development economics (Fall and Spring), two sections of econometrics (Winter), and international trade (Spring). He also has an active research agenda in applied microeconomics focusing on health economics (sustainable policy, comparative effectiveness and health care disparity), education economics (socio-economic determinants of disparity in education and access to schooling), development economics (farmer’s productivity, inequality and poverty) and international trade (exchange rate and trade). He has more than 12 years of teaching experience at the collegiate level, including a stint teaching MBAs this past year as a visiting professor at the University of South Dakota. And, of course, the indefatigable Professor Gary Vaughan will be back this year with an expanded role for the innovation & entrepreneurship program. Once again he will be teaching sections of financial accounting (ECON 170) in the Fall and Spring, as well as playing a role in the entrepreneurship courses (ECON 180 and ECON 211). In addition, he will be offering a follow-up to his financial accounting course, Topics in Finance (ECON 295) in the Winter term. Professor Vaughn is the founder and runs Guident Business Solutions in Appleton, and sits on the board of several organizations, including Board of Advisor member to College of Buisness and Legal Studies at Concordia University and the Self Employment in the Arts (SEA) Organization. Welcome to Professors Rhodes and Devkota and welcome back to Professor Vaughn. We hope to have a welcome Econ Tea in the next week or two. I Wonder Why It’s Called ‘Green Bay’? Slate.com points us to a (possibly) interesting U.S. map that lists locales by the literal meanings of the underlying name. For instance, my own hometown of Champaign, Illinois, comes from a French word, not for the delicious bubbly (via the grapes of the Champagne region), but rather for a flat, open area of land — a plain plane, so to speak. The Fever River District, as it was called, boasted a boisterous population, and was fully equipped with saloons, dance halls, vigilance committees, and daily mayhem, while the site of Chicago was still an onion swamp. Chicago is now the biggest city in the state of the Land Where People Speak Normally (well, at least in Normal they do, I suppose), whereas Michigan means Big Lake and Wisconsin means Red River. Contrary to popular belief, Fond du Lac does not mean “fondness of lactose products,” but actually means font (founding, or, in this case, bottom) of the lake. And, of course, Appleton is not a tribute to this region’s prolific apple output, but instead is named for Amos Lawrence‘s presumably lovely wife, Sarah Elizabeth Appleton. As it turns out, after Appleton became Appleton, the aptly named Reverend Reeder Smith convinced Lawrence to use the town name as an early college development strategy. To wit, they told renowned philanthropist Samuel Appleton that the town was actually named for him, Samuel. Marital vows only go so far, I guess. For his part, Samuel was so pleased that he wrote a check for $10,000 to endow a library — adjusted for inflation, that comes to about $250,000 in today’s dollars. Assuming you can still trust a library after that, you can read a blurb of the sordid history here. Finally, for those of you wondering, there is no truth to the rumor that Samuel Appleton was known to his friends as “The Big Apple”. Posted on June 20, 2013 June 22, 2013 Author David GerardCategories In Case You Were Wondering, Though You Probably Weren'tTags Don't say we didn't tell you so1 Comment on I Wonder Why It’s Called ‘Green Bay’? “Mr. P” points us to an infographic that breaks down a topic of potential interest to some of you — student loan debt. It appears that the median student owes between $10,000-$25,000, with the average between $10,000 and $50,000. My guess is that this isn’t the first you are hearing of this. As the previous post indicates, it might be the case that higher education is about to see a shake up, which will probably include people more cognizant of the debt they are taking on. It is also true that some of this debt seems completely justified, as college graduates continue to enjoy a healthy premium over those who lack a college degree. In the previous post, I mentioned the Robert Whaples survey of American Economic Association (AEA) members on their public policy views. Of course, Whaples isn’t the only one with access to Survey Monkey, and with the help of some of my colleagues, we gave the same survey to students in Freshman Studies, Economics 100, and Economics 300 courses. The Freshman Studies sample (n=26) should be fairly representative of incoming freshman population, as every student takes freshman studies and these students are allegedly distributed randomly across the sections. I have data from two sections with a 90% response rate. 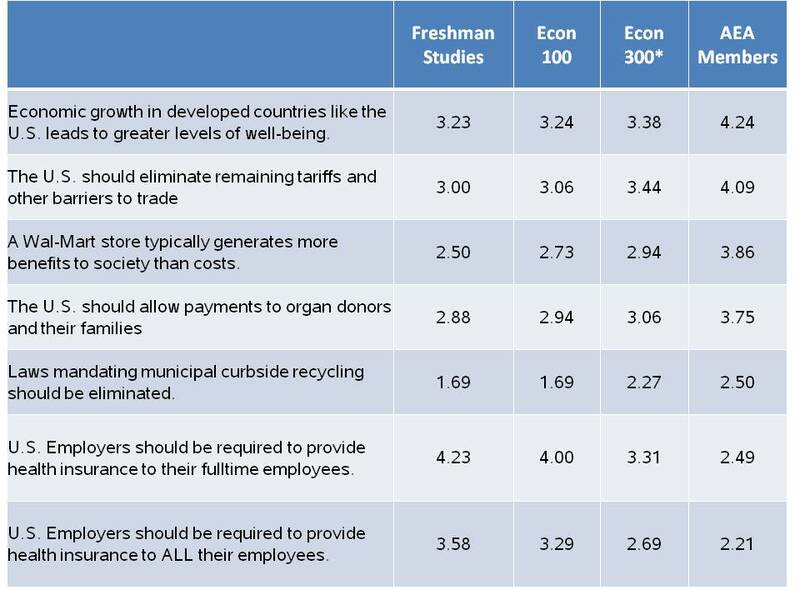 The Econ 100 course is predominantly freshman as well, but is a much different cross section of the University, with 70% planning to major in economics or some other social science. The Econ 300 is, of course, generally for students taking the first “major” step to joining Team Econ down here on Briggs 2nd. It is well-worth noting that the Econ 100 (n=35) and Econ 300 students were surveyed at the beginning of the course,* not the end. Perhaps next year we will switch that up. The survey participants rate the questions on a 1-5 scale, with 1 being strongly disagree and 5 being strongly agree. Überwriter Michael Lewis has written extensively about the potential economic impacts of an earthquake in Japan, “How a Tokyo Earthquake Could Devastate Wall Street and the Global Economy.” Interesting thing about this is that he wrote the piece back in 1989!!! My eyes aren’t quite good enough to make out that copy online, unfortunately, so I’ll wait for some younger eyes to give me the summary. On the plus side, the global economic situation is far different that it was back then. Indeed, back then we had an MIT economist telling us that if we didn’t start following Japan’s lead that the US was in for a meteoric drop. Instead, it was Japan’s economy that was in for a lost decade, not the US. But, on the minus side, that our economic situation is different doesn’t mean that our financial institutions are any less vulnerable — again, see Lewis on this point. He’s a prolific writer, that’s for sure. In another sign that the world has changed, Gilbert Gottfried was fired as the voice of the Aflac duck for telling tasteless jokes about the disaster on his Twitter feed. Isn’t that sort of like firing Big Bird for being tall and having feathers? I saw the Lewis tip at Kottke and the Gottfried bit at Slate. Professor Gerard is partnering with Professor Maryuri Roca (Chemistry) for a section at 2:30 on Thursdays, and I (Galambos) am co-leading a section at 8:30 on Fridays with Professor Beth De Stasio (Biology). We’d love to have you in our sections. Based on some book reviews (here’s one), I will have a lot to say about this book, but I promise I’ll try to shut up most of the time. I know one chapter beats up on IKEA pretty badly, and I’m just not sure how I will handle that… Let me just say that other than a couple of chairs, perhaps, all our furniture comes from that wonderful, CHEAP, tastefully Northern European design paradise. ***An earlier version of this post said the book would be available at the Gift Shop. It turns out that this is not true. We sincerely apologize for the mix-up. Q: Would someone who wrote a bad thesis and defeated a large snake get the same grade as someone who wrote a good thesis and defeated a small snake? Though the publishing industry is on the rocks, I’ve been getting The Atlantic Monthly for more than 20 years. It’s a great general interest publication that has contained some of my all-time favorites, like “Why McDonalds French Fries Taste So Good,” “The Truth About Dogs,” and the extraordinary “Laws Concerning Food and Drink.” I often will send these to my former students in the Peace Corps, who are always happy to get something interesting. Actually, they are happy to get anything, period. I was reminded of these when my renewal notice came along with my latest edition and I was wondering whether I should continue to support these guys. The answer was a resounding yes. And all that is before I’ve gotten to the feature articles I want to read, which generally run about 2000 words longer than a reasonable person would find reasonable. The economics writing is a different matter, a lot of what Paul Krugman used to call “pop internationalism.” I remember reading a cover story when I was in grad school called “Head to Head,” where Lester Thurow was arguing that the Japanese and Europeans were going to bury the US in the 1990s (I don’t see that one in the archives now?). It’s not clear why they keep giving that guy space. But, I don’t read it for the economics. So there you have it, my pitch for you to subscribe to The Atlantic. Here’s an interesting fact — a legislator with a degree in political science is more likely to vote to cut research funding for, wait for it, political science. Perhaps they know something? Here’s from Uscinski and Klofstad. In October 2009, political scientists learned of a Senate amendment sponsored by Tom Coburn (R-OK) that would eliminate political science funding from the National Science Foundation budget. The American Political Science Association condemned the proposed amendment, and concerned political scientists contacted their senators to urge the amendment’s defeat. On November 5, 2009, the amendment was defeated 36-62 after little debate. This article examines the vote on the Coburn Amendment to understand the role that senators’ personal, constituency, and institutional characteristics played in their votes. Logit analysis reveals that even after controlling for party, several factors significantly predict the vote, including the number of top-tier political science Ph.D. programs in the senator’s state and whether the senator graduated with a bachelor’s degree in political science. 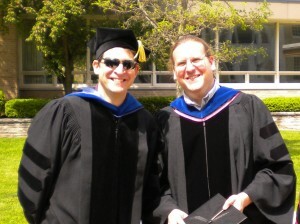 Joseph Uscinski and Casey A. Klofstad. 2010. “Who Likes Political Science? : Determinants of Senators’ Votes on the Coburn Amendment”. PS: Political Science and Politics October: 701-706. It might shock, shock many honor-bound Lawrentians that there are college students out there that don’t do their own work. In fact, as many of you are likely aware, there is a robust market for term papers out there that allow you to buy papers from levels from high school to Ph.D. on topics ranging from, well, from Moses Abramovitz to Frederik Ludvig Bang Zeuthen. It appears the going rate is about $10-$15 per page depending on how soon you need it. This is certainly not a new phenomenon. Years back, Seth Stevenson surveyed the market and gave a few pointers for cheaters and lazeabouts to choose the right site to purchase a paper, and he looks at some of the market characteristics. For example, a custom paper is about twice as expensive as an off-the-rack piece. We ordered a typical college term paper from four different essay mills, and as the topic of the paper we chose… (surprise!) Cheating… We submitted the four essays to WriteCheck.com, a website that inspects papers for plagiarism and found that two of the papers were 35-39% copied from existing works. We decided to take action with the two largely plagiarized papers, and contacted the essay mills requesting our money back. Despite the solid proof that we provided, the companies insisted that they did not plagiarize. One company even tried to threaten us by saying that they will get in touch with the dean at Duke to alert them to the fact that we submitted work that is not ours. I like their moxie — deny, deny, deny, threaten. The comments to Ariely’s post are also interesting. Do you think the liquidity preference is the choice of beverages at our weekly Econ TeaBA? Or perhaps you are under the impression that a LaGrangian multiplier is a French calculator? If so, you might consider checking out The New Palgrave Dictionary of Economics online. The dictionary is a great resource for quick, readable, often authoritative pieces covering everything from Moses Abramovitz to Frederik Ludvig Bang Zeuthen. This new edition retains the inspiring tradition of bringing together the world’s most influential economists writing in their own voice on their areas of expertise, but in its online incarnation it has married this tradition with the benefits of a dynamic, updated resource serving the information needs of a new generation of economists. Seriously, this is an excellent resource, and you should utilize it. It’s brought to us by the good folks at The Mudd. We will be meeting shortly, so if you have questions about offerings in 2012, please let us know. The term is upon us and that means it’s time to start posting things that might actually have some utility for someone (for instance, me). I will also be offering an independent study associated with Schumptoberfest™ weekend, October 22-24. Check with me for details. See you on Briggs 2nd. Which Planet Are We On? Indeed! Given the information in the statement, I would call it a “Capital Loss” special. Nothing has been said about what happened to the general level of prices or about the purchasing power of the asset. Without such information, one can say nothing very interesting about the change in the price of one specific asset. It’s certainly possible that the price of an asset (call it shares of Lehman or Enron stock) can fall with or without inflation or deflation. I can’t tell what the purpose of the example is; hence, as Professor Gerard points out, Planet Money needs help. They may need as much help as the US Senate who rejected Fed Board of Governor’s nominee Peter Diamond because he allegedly was not a macroeconomist. Ah, those discerning folks who man our legislature. Posted on August 6, 2010 August 6, 2010 Author Merton FinklerCategories General InterestTags Don't say we didn't tell you so, We Get It!1 Comment on Which Planet Are We On? Indeed! Which Planet Are You On? ADAM DAVIDSON: Ladies and gentlemen, I have an amazing investment opportunity for you. Give me $100 – just a hundred – and in one year, I promise it will be worth 93 bucks. We call it the _______ special. If you said “inflation,” congratulations, you’ve mastered one of the simplest concepts about the value of a currency. As the general price level goes up, the purchasing power of the currency goes down. In this case, the $100 you lent is worth only $93 when you get it back. That’s why in times of inflation, people are reluctant to lend money. If you said “deflation,” congratulations, you’re the co-host of NPR’s Planet Money. And that bit of Econ 120 fail is from a “patented Planet Money explainer.” Yikes. There was an entire story yesterday written around this bit of confusion. Let me ask you a question — is that enough to knock that program off of your trusted sources list? They ostensibly write about economic issues, yet neither the founder/writer nor any editor/producer was able to catch such a colossal blunder. If they are that confused about the easy stuff, how much do you trust them to explain credit default swaps or the toxic assets program? (And, as regular readers know, we love the Toxie Cam). Must be that solar eruption. Posted on August 4, 2010 August 4, 2010 Author David GerardCategories General InterestTags Don't say we didn't tell you so, We Get It! The basic idea is so simple that it’s hardly controversial. If you reduce the cost of doing something, you would expect more of it. The classic Sam Peltzman paper has to do with making cars safer, which reduces the costs (in terms of potential injury or fatality) and hence increases “driver intensity,” as Peltzman puts it. The startling result is that the behavioral changes completely offset the technological improvements, though this does not have to be so. This is similar to the “rebound effect,” where improving energy efficiency or fuel economy, for example, causes people to set their thermostats more aggressively or to drive more miles (that is, because the marginal costs go down). The NHTSA had volunteers drive a test track in cars with automatic lane departure correction, and then interviewed the drivers for their impressions. Although the report does not describe the undoubted look of horror on the examiner’s face while interviewing one female, 20-something subject, it does relay the gist of her comments. After she praised the ability of the car to self-correct when she drifted from her lane, she noted that she would love to have this feature in her own car. Then, after a night of drinking in the city, she would not have to sleep at a friend’s house before returning to her rural home. Well, that certainly makes me feel safer. Peltzman is one of the most prominent empirical economists ever. Certainly, having an “effect” named after you is a pretty big deal. Some of the more astute of you also recall Peltzman from the Stigler-Peltzman capture theory. Love him or hate him, he is an interesting character. I recommend this interview at EconTalk. What’s with the Funny Hat? In our continuing attempt to understand the world around us, today we will talk about the tradition of wearing cap & gowns for graduation ceremonies. Well, the first thing you need to know is that this dates back nearly 1000 years, and the academy is a notoriously conservative place. In the words of F.M. Conrford, in his advice to young academics, “Nothing should ever be done for the first time.”* The corollary is that once we get started on something, it’s tough getting us to stop. Standard fashion around 1100 and 1200 A.D. dictated long, flowing robes and hoods for warmth; the greater a person’s wealth, the higher the quality of the fabrics. This attire went out of style around the Renaissance. But sumptuary laws, often designed to prevent people from dressing above their class, kept academics (who were relatively low in the social hierarchy) in simple, unostentatious robes through the 16th century. Thereafter, academics and students at many universities wore robes for tradition’s sake. At Oxford, robes were de rigueur until the 1960s and are still required at graduation and during exams. Continue reading What’s with the Funny Hat? But What About the Cool ‘Stache? Vikings did not wear horned helmets. According to [Cecil Adams], “contemporary Viking era artwork shows roughly half of Vikings in battle bareheaded, while the rest wear unremarkable dome-shaped or conical helmets.” The idea that Nordic invaders of the ninth and 10th centuries wore headgear festooned with ox horns developed a thousand years after the fact, when a Swedish artist illustrated them as such for a poem based on an old, Icelandic saga. No self-respecting Viking warrior ever wore a horned helmet in battle–they weren’t that dumb. As anyone who has done any slaughtering can tell you, horns provide nothing more than a good handhold to steady your work while you’re slitting someone’s throat. Keep that in mind next time you enter hand-to-hand combat. We talked about climate arithmetic a bit in class this morning in Econ 280. It’s very difficult to imagine a scenario where the US reduces its CO2 emissions enough even to stabilize “our share” of atmospheric concentrations. That is, reducing carbon emissions on the order of 50-80% of current levels. Of course, to stabilize global concentrations, the entire world would have to fall in line with such a strategy, and Der Speigel piece points out that this isn’t going to happen. According to a just published survey by payscale.com, economics majors receive the highest mid-career salary among all majors surveyed. The $50,000 average starting salary isn’t too shabby either. Check out the details.